Got containers on your brain but worried about how you'll support your stateful applications? Introducing Trident – the fully automated persistent storage provisioner for Red Hat OpenShift! With Trident, you no longer have to worry about long lead times to provision storage for your container applications. Trident grabs your persistent volume claims and automatically maps your request to the appropriate class of storage—on the fly! What's not to love? Developers love it and admins love it. No more endless waiting for service tickets to provision container storage. Trident is easy to install and set up so you can be up and running quickly with dynamic, persistent storage provisioning. There's something for everybody when Trident is deployed in your enterprise container environment. Join us for this exclusive webcast to find out more about Trident and much more including Ansible Tower, the automation engine from NetApp and Red Hat for the next-generation data center. Mark your calendars and register today, you don't want to miss this! You’ll also find out how NetApp® MAX Data software leverages persistent memory in the server and fuels ultra-low latency, support for huge datasets, and enterprise data services for in-memory applications. 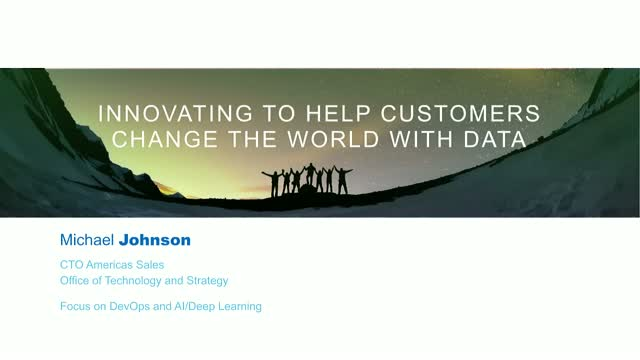 If you’ve ever wondered what AI means in your industry, and how companies take advantage of deep learning and their data to create new and disruptive business opportunities, this webcast is for you. Enterprise IT is facing huge volumes of new data that is overwhelming legacy SAN solutions. Rather than get trapped with the outcomes of an aging legacy system, learn how you can leave slower data access, increased costs, and the inflexibility of a legacy infrastructure behind. Join the webcast “Demanding Workloads Demand NVMe” and find out how moving to an end-to-end NVMe infrastructure can clear your path toward data center modernization. You will hear directly from three leading experts: Andrew Grimes from NetApp, Eric Burgener from IDC, and Naem Saafein from Brocade. With the whirlwind pace of artificial intelligence (AI) and deep learning technology, many enterprises are challenged with how to advance new AI projects from proof of concept to production. Join the webcast “Drive Disruptive Innovation at Scale with AI” and find out how you can enable a secure and smooth flow of data for your AI workflows, from edge to core to cloud. You will hear directly from three leading experts: Monty Barlow from Cambridge Consultants, Ritu Jyoti from IDC, and Santosh Rao from NetApp. AWS and NetApp are both dedicated to supporting their customers' data in “well-architected” ways. In this session, AWS and NetApp discuss how their partnership and tools support your data management. Join NetApp® IT as we share key insights that we discovered on our own trip to the cloud. • The biggest surprises and lessons learned along the way. Come and learn from NetApp. By untethering the digital workspace and enabling collaboration, End User Computing (EUC) is an important enabler of digital transformation. Despite the many advantages of EUC solutions—centralized management, increased security, and easy accessibility to name a few—many organizations have been slow to adopt. To ensure user productivity, you must also accelerate the key applications and databases users rely on, matching the efficiency of virtual desktops. Addressing unpredictable user workloads in a complicated EUC environment can require painful re-architecting. Introducing new workloads may rob resources from existing workloads, leaving users unhappy. A better approach to infrastructure for End User Computing is needed. Netapp HCI was built to address the challenges to support your digital transformation to EUC. We’ve heard it before: “I can’t use the cloud because my data won’t be secure or compliant!” You might feel the same. Many companies struggle with this challenge, yet even government agencies with the strictest data privacy requirements use the cloud. In today’s rapidly changing world, how can you tell which clouds and cloud types are right for your organization’s needs, now and in the future? Wouldn’t it be great to use a public cloud for more workloads, even those with sensitive data and compliance requirements? In our webcast, "You Put Your Data Where? Protecting Your Data in the Hybrid Cloud," we will share how public organizations with strict data privacy regulations leverage and deploy hybrid cloud to meet their business needs. NetApp’s partner 1901 Group will speak about a government law enforcement agency that has deployed hybrid cloud to gain better access to compute capabilities while keeping legal data under lock and key. Additionally, BriteSky, a Canada-based service provider, will discuss how they help customers use cloud resources and still maintain sovereignty over their corporate data. Whether you’re a public or private company, government agency, U.S.-based or multinational organization, this informative webcast will help you put your data where it's accessible to cloud infrastructures yet fully protected. Join us to learn how NetApp and our partners help people like you meet data compliance and data sovereignty requirements and deploy cloud architectures to suit your business needs. It’s clear Big Data Analytics drives profitability and is becoming essential to the success of enterprises. Unfortunately, first generation, share-nothing analytics platforms are not sufficient to meet the security, reliability, scalability or performance requirements of business-critical applications. They lack fundamental capabilities necessary to protect critical data, drive costs down, and provide the flexibility needed to meet evolving needs. First generation Big Data Analytics platforms are built around clusters of individual compute platforms with internal direct-attached storage (DAS), but this architecture is inherently problematic and non-scalable. Component failure, particularly DAS, can cause the analytics’ process to fail or drastically slow down. There is no convenient way to back up the data and quickly restore it, nor any way to manage the data life cycle as analytics become core to the enterprise and the datasets grow exponentially. It is difficult to scale compute and storage elements independently, or even at all. In this webcast learn how an Innovative Big Data Analytics platform addresses and overcomes these challenges. This new, highly scalable analytics approach provides far more flexibility, and effortlessly leverages the cloud in combination with on-premises resources. Compute and storage infrastructure can be scaled independently – driven only by current requirements. Analytics applications can now efficiently access data directly from existing enterprise storage systems, eliminating unnecessary replication of data. See how an innovative big data analytics platform can reduce server, storage and software license costs by optimizing resource utilization, and provide all the data security, scalability, performance, and analytics capability required by your enterprise. IT leaders are under tremendous pressure to harness today’s wealth of data and apply it to create new value across their organization—all with limited time, skills, and budget. In a world where technology is changing our everyday lives, digital transformation tops the strategic agenda in most organizations. To successfully transform, data is becoming the lifeblood of an organization, enabling new customer touchpoints and innovative business opportunities. In this webcast we will share how customers are transforming their SAP environments to be more agile and cloud connected with NetApp. Getting value and insights from your SAP data quickly and reliably can differentiate your organization and optimize operations. Learn how to unleash the power of your data to achieve a new competitive advantage. Join us! Learn how to avoid cloud lock-in and secure your data. Got a cloud mandate? Many folks have walked in your shoes... concerned about data privacy, cloud lock-in, and wondering, "Will it really work?" •How do I use cloud technology without putting my data at risk and sacrificing performance? •How do I avoid cloud vendor lock-in? •Our cloud costs are growing fast; how do I control our expenses? Moving to the cloud can be intimidating and challenging; you don’t have to go it alone. NetApp can help you harness the power of the hybrid cloud. We hope you'll join us! Register today, spend an hour with us and learn all you need about getting started and optimizing your cloud – and then some! Do you have questions about the nuanced differences between data security and data privacy? Join us for part three in this webcast series where we will host an interactive panel with some of NetApp’s leading subject matter experts in this space. We’ll start the session with an interactive discussion amongst our panelists around external and internal threats you should be concerned with, data security in the cloud, best practices around auditing, leveraging technology to meet data privacy requirements, and much more. We’ll then take questions from you, our live audience on anything top-of-mind. This invaluable session will be a webcast you won’t want to miss. Regardless of your company's data management needs, the NetApp America's BrightTalk channel has something for everyone. Worried about your expanding data storage needs? Not sure how your data is protected? Tired of worrying about scalability? We can help.